Apple has again shown support for December 1st, World AIDS Day. 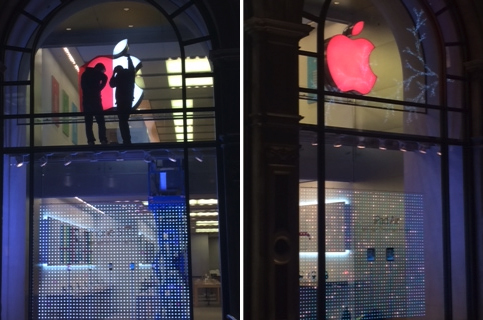 They have even changed the color of Apple logo at some of their flagship stores. Apple is famous for supporting the project. Steve Jobs worked with Bono to get Apple products behind the cause and available to the masses. Recently, Jony Ive worked with Marc Newson on different products not only from Apple but other manufactures to be auctioned off at a one of a kind event. Hoping to raise as much as possible for the (PRODUCT)RED cause. All the following games and apps are on sale for Black Friday and some are even on sale until Cyber Monday. If you have been on the fence, now is the time to pick up some cheap apps or games. Ashton Kutcher played the late Steve Jobs in the movie “Jobs”. The movie wasn’t quite a hit with critics or fans, scoring only a 26% rating on Rotten Tomatoes and 2.5 stars out of 5 on IMDB. It looks as if Apple may be tapping Quanta Computer as the next producer of their rumored product, the iPad Max. Digitimes is reporting that Quanta Computer is ramping up their facilities, the device is expected to launch in the second half of 2014. Apple was awarded 290 million dollars today by a San Jose jury. Samsung was ordered to pay Apple the money after the second ruling in favor of Apple. Samsung will most likely appeal the decision like they did with the first one.